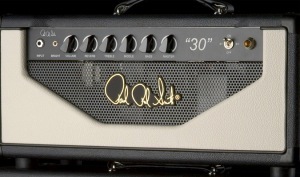 PRS say that the 30 gives you an ‘English sound with an American twist’. Obviously enough, it’s a 30-watt valve amp. It’s got four EL84 valves to provide the crunch and has a rather clever master volume that is progressively dialled out of circuit as the amp’s volume reaches its maximum setting. The 30 is available in both head and combo versions – all made in the US (Stevensville, Maryland). So here you go. Have a listen – see what you think.